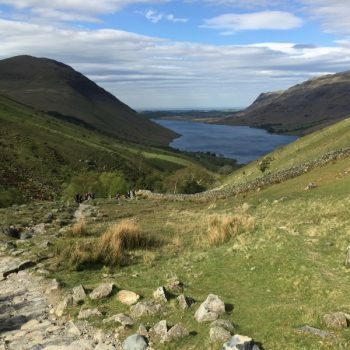 Whitehaven Ramblers have raised £1,300 to help “fix the fells” in the Lake District through a number of events held as part of their 90th Anniversary year celebrations. The Whitehaven Ramblers, who all enjoy walking in the Lake District fells, decided to put something back in to repairing and maintaining the upland fells paths and the landscape they love. To raise the money, members undertook a sponsored dip in the sea at Whitehaven on New Year’s Eve, organised a raffle, contributed various personal donations and ran a tombola at their 90th Anniversary event in Whitehaven on 2 June 2018. Joanne Backshall, Fix the Fells Programme Manager, said, “We are really grateful for this kind donation towards our work repairing and maintaining the upland paths of the Lake District. We could not do this without the fantastic help and support we receive from groups and individuals such as these who appreciate and enjoy the fells”.